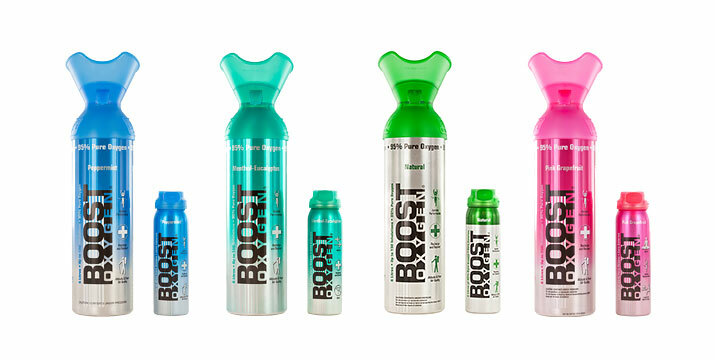 Boost Oxygen is the market leader in its field; delivering supplemental portable oxygen with an array of active ingredients. Essential oil aromas have been added to enhance the experience and process of oxygen absorption, leaving you feeling, and looking, revitalised. Our aromas include: peppermint, pink grapefruit and menthol-eucalyptus. Boost Oxygen has been reported by young and old alike as the natural health and well-being aid. Many Boost Oxygen users experience increased concentration because of an improved oxygen supply to the brain, and find that breathing Boost Oxygen helps them to relax and reduce their stress levels. Using supplemental portable oxygen also supports and boosts the immune system. More oxygen means more energy! Stress is a common contributor to fatigue and decreases the ability to absorb oxygen into the blood, resulting in diminished oxygen to the tissues. Breathing Boost Oxygen will oxygenate tissues, restoring what has been depleted through exhaustion. For enhanced health and wellbeing, try BOOST Oxygen in Pink Grapefruit or Menthol-Eucalyptus. Take two-to-three inhalations when looking to increase energy, enhance mental alertness and boost your immune system. INDOOR PLANTS ARE SO MUCH MORE THAN JUST DECOR. THEY HELP REDUCE STRESS AND PURIFY THE AIR THAT WE BREATHE!